It is copyright © Aryanil Mukherjee and Jacket magazine 2007.
whose loghouse full of children did the hurricane sweep away ? whose wife was eloped by fresh flakes of cotton ? Aryanil Mukherjee grew up in Kolkata, India. He writes in both Bangla (Bengali) and English. He has authored two books of poetry Khelaar Naam Sabujayan (The Greening Game, Kolkata International Book Fair, Spring 2000), Hawamorager Man (Weathercock Mind, 2004) and a book of hybrid essays. Aryanil was awarded the Kabita Pakkhik Samman (Poetry Fortnightly Honor) for 2007. His English work has been published in Znine, Maverick, Rain Taxi, Moria Poetry etc. Aryanil works as an engineering mathematician and lives in Cincinnati, USA. 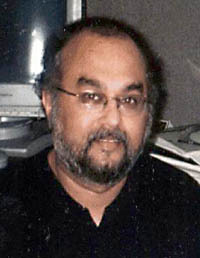 He edits KAURAB (http://www.kaurab.com), a famous Bangla literary magazine published since 1970. The online version is also the first Indian language poetry webzine.